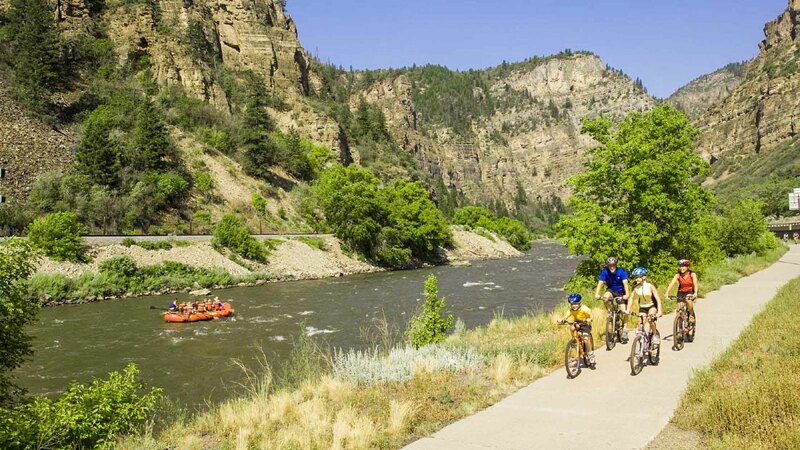 Just a few short miles from the Glenwood Canyon Resort, in and around Glenwood Springs and the surrounding mountain towns, you’ll find so many activities that you will absolutely run out of time before you run out of things to do. We guarantee you’ll be planning your next trip back before you even leave! One of the most popular hikes in all of Colorado happens to be only a few minutes drive from the resort. 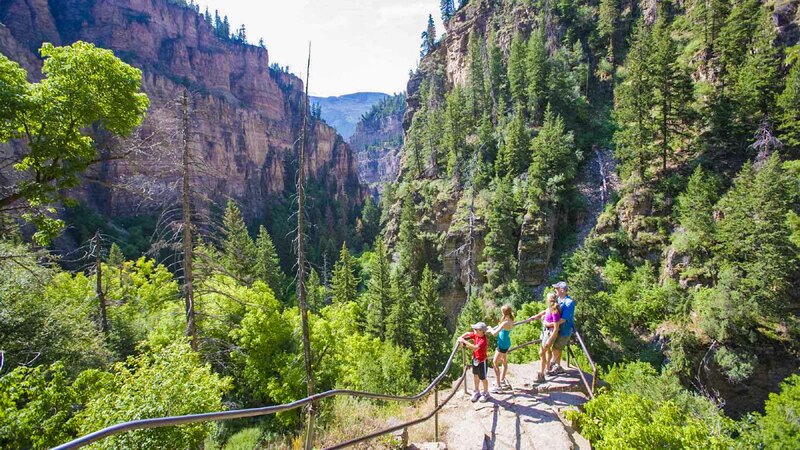 The ever popular Hanging Lake Trail is a challenging 1.2 mile uphill hike that is worth every step. Your reward at the top is a beautifully suspended mountain lake that is fed by cascading waterfalls, so make sure and bring your camera! When you arrive at the resort, we’ll provide you with an entire brochure of more than 30 hiking and biking trails in and around the area. Remember, the 16 mile paved Glenwood Canyon Recreational Trail is just steps from the resort, so bring your bike or rent one of ours. The world famous Glenwood Hot Springs Pool is less than five minutes from No Name and is a must on the checklist here in Glenwood Springs. Kids will have a blast on the slides and splashing around in the huge pool while parents can leisurely enjoy the warm water and sunshine. If you prefer a greater selection of multi-temperature pools, a little less noise, and the opportunity to enjoy an adult beverage, be sure to check out the Iron Mountain Hot Springs with 16 private pools overlooking the Colorado River. The Glenwood Caverns Adventure Park has surely turned into another must on the checklist while in the valley. On the top of a mountain they have their very own amusement park with exciting rides and fun games for everyone. Their main attraction being the fairy caves, they will take you on guided tours through either the family route or on a more challenging (think very small spaces) spelunking tour. For the golf fanatic, there are more than a dozen golf courses within 40 miles of the resort and several phenomenal golf courses in and around the Roaring Fork Valley available to the public. Glenwood Springs Golf Club, known as “The Hill”, is a 9 hole favorite of locals. 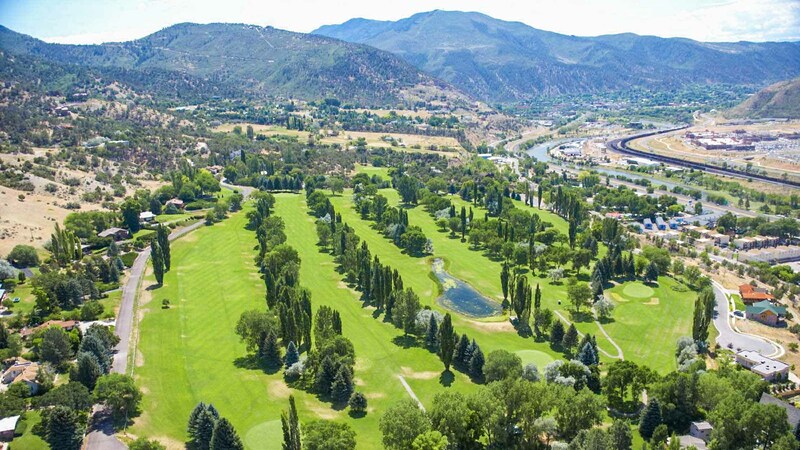 Ironbridge Golf Course in Glenwood Springs is a family friendly 18 hole course. 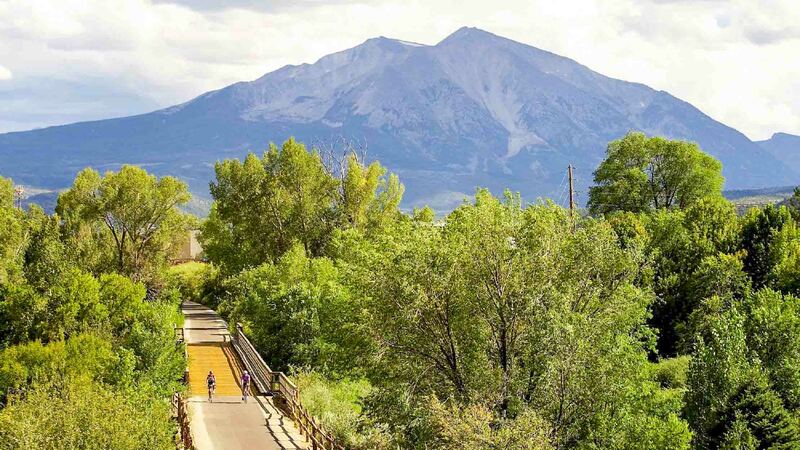 River Valley Ranch in Carbondale offers a challenging course with stunning view of Mt. Sopris. Lakota Canyon Golf Club in nearby New Castle, is an 18 hole championship course. Yep, we also have miniature golf courses in Glenwood for family fun. Spend the day on one of our gold medal rivers with one of several professional guide services in the area. The Colorado, Roaring Fork, Frying Pan and Crystal are all world class, catch and release rivers. Of course there’s nothing stopping you from casting your line from the comfort of your own riverfront site at the resort. Be forewarned…we do not sell worms at the resort. There are great opportunities for climbing throughout the Roaring Fork Valley and in nearby Rifle. Popular sites include No Name in Glenwood Canyon and Rifle Falls with challenging sky high walls. The stunning vistas at the top of your climb is all the reward you’ll need. Rifle Gap and Harvey Gap Reservoirs offer clean, clear waters for swimming, boating, water skiing and wind surfing. We’ll happily provide you with directions. From Glenwood to Aspen and Snowmass, there are ranches and stables that offer up the opportunity to saddle up and enjoy a guided trail ride. At the resort, we’ll be happy to advise you based on the needs and wants of your party. Glenwood Springs has a variety of shops to delight every member of your family, from souvenirs to top of the line outdoor gear. Nearby Carbondale offers some wonderful art galleries and boutiques. 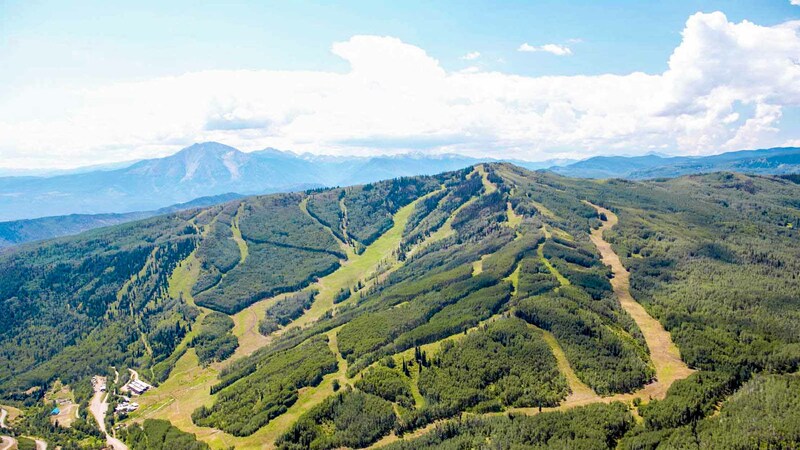 Then there’s Aspen and Vail, need we say more? Just make sure to bring along your credit cards! Steakhouses, Mexican, Italian, Chinese, Pizza, Tai, Cajun, BBQ, Gourmet Burgers and of course, fast food joints. You name it, we have it. That is, of course, after you’ve had your fill of our fine food & drink at our own No Name Bar & Grill at Glenwood Canyon Resort. 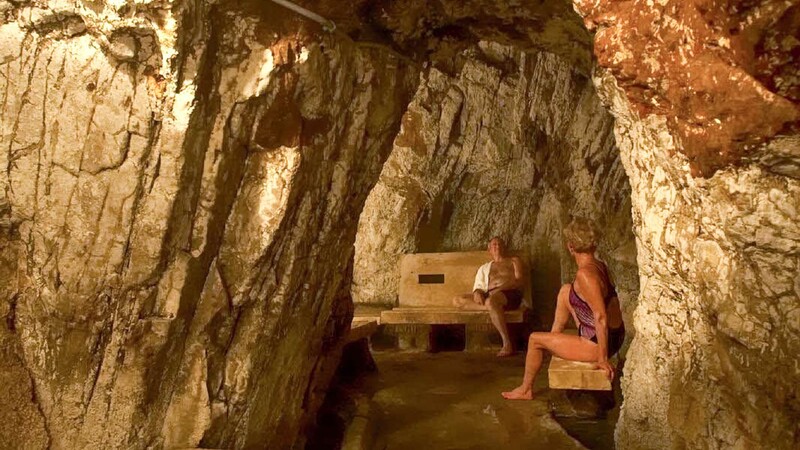 Try a massage at the Yampah Spa and Vapor Caves, Spa of the Rockies or Splendor Mountain Spa (to name a few) for a more relaxing activity. In a hurry? Try Simply Massage in Glenwood Commons. Colorado is one of the most beautiful places on earth so why not take a drive to one or more of these stunning attractions and locations? Here are just a few of our favorite suggestions. Visit the historic Redstone Castle in Redstone on your way to visiting the historic Crystal Mill in Marble. Take a scenic byway drive over McClure Pass to Paonia or Crested Butte. 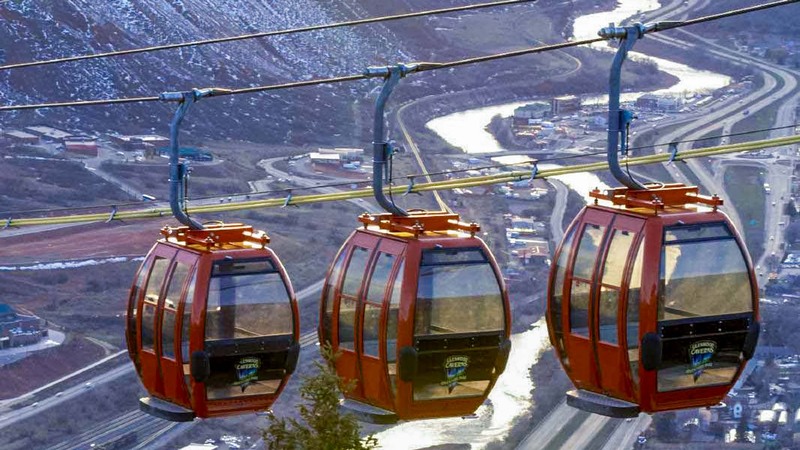 Enjoy the stunning views on your trip to Aspen where you can take the gondola up Aspen Mountain, visit Maroon Bells or just keep going over the infamous Independence Pass. Vail is a great tourist destination town with the opportunity or take the gondola up and bike down, or just relax in town and shop the day away. The cooler fall weather brings spectacular color change to the mountains. A trip to Glenwood Canyon Resort is your perfect opportunity to take in the fall foliage splendor!